I just purchased two Weber Power Plate kits at an auto parts swap meet, and while trying to learn more about them, I found this forum. I understand Troy Patterson of TMP Carbs is the resident expert. The two kits I have are a #100, and a #8302 I believe (didn't write them down), as well as some tuning kits, etc. 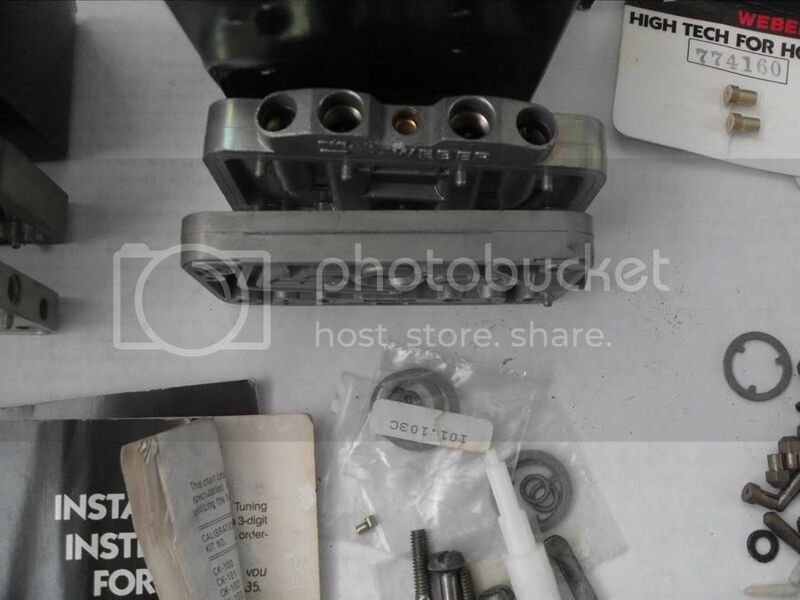 I have a number of old Holley carbs, including some 715 cfm LeMans, some 660's, some 3-barrels, an old List 4575 Dominator, and a Boss 302 carb, and plan to build one of these for either a HiPo 289 project, or a 331 stroked Boss 302, whichever will benefit the most from the Weber modifications. What can anyone tell me about these? Sorry to be a buzzkill, but you will find they will absorb a tremendous amount of time (and money) and unless you make your own emulsion tubes they will never work as well as the original Holley metering blocks. Relative to the float level in the Holley bowl, they locate the Weber emulsion tube with the uppermost holes about ½” above the float level for which they were designed in the Weber carb. Because of their length, it isn’t practical to use those emulsion tubes within a Holley envelope. Welcome to ST. Troy is on " holiday " from this forum but if you use the search function , you will have hours and hours of very imfomative reading and learning . Jeez, what a can of worms! I can't believe things escalated to that level. I always though the purpose of a forum is to share and exchange ideas, bickering was supposed to be left in grade school. All that aside, thanks for the info, and I hope those who do have some experience with the Weber Power Plates do chime in. 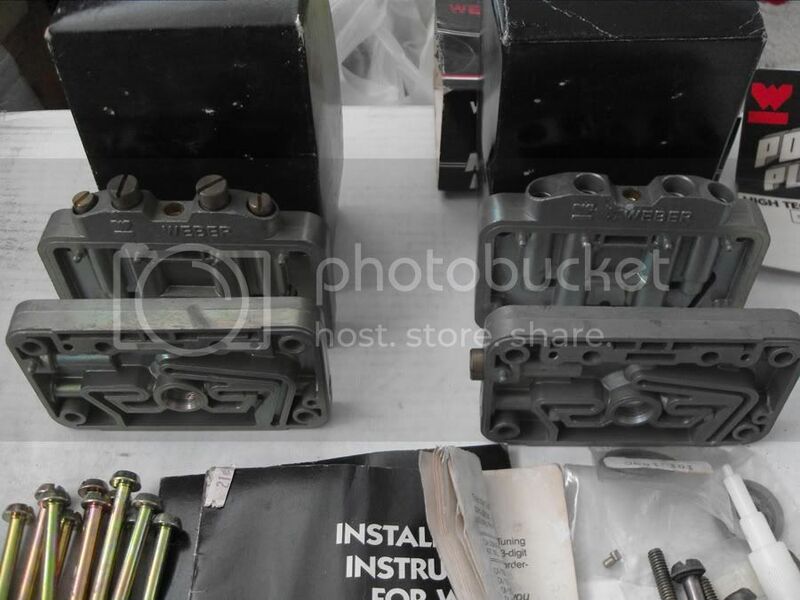 I also have questions regarding the Autolite Inline 4-barrel carb, and converting my big-block Ford from mechanical fuel injection to a simple stand-alone electronic fuel injection system (my friend swears by FAST, my budget says MegaSquirt or fabricate). I've accumulated a bunch of cool old parts over the years, but have no experience with them. Sorry to bust you chops as well, Tuner is probably the one you want to listen to most. There are a lot of ways to make a carb work, and emulsion tubes are a good idea, but the power plates should have started with a fresh design for a tube suited to fit the metering block dimensions of a Holley. It's not that they won't work, just not ideal and not as well as properly set up Holley blocks. Tuner can help with the Autolite as well. no1musclecar wrote: Jeez, what a can of worms! I can't believe things escalated to that level. I always though the purpose of a forum is to share and exchange ideas, bickering was supposed to be left in grade school. dieselgeek (on this forum) would be the one to answer the injection questions. Personally I'm hoping he'll write a book. So every DCOE emulsion tube is the same in this regard? Thanks for the heads up, and the leads/recommendations. I'm really still learning about a lot of things, but over the years I have acquired a variety of what are now hard to find items. 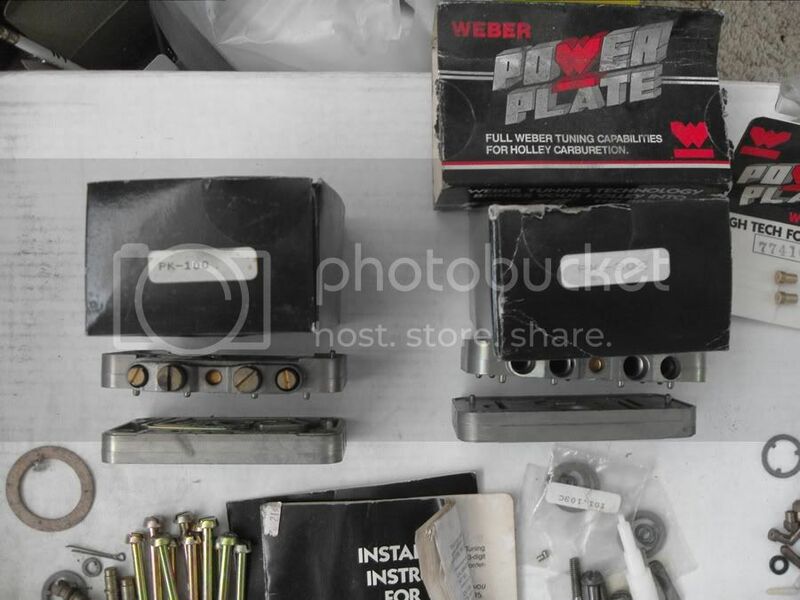 Unusual or exotic induction systems have always been a focus, so I've acquired Weber 48s, a big and little Autolite Inline 4V, a couple 3-barrels and 715cfm LeMans Holleys, etc., and an old List 4575 Dominator. For those I've got a variety of manifolds to fit the three engines I'm building, a roadrace HiPo 289, a multi-purpose stroked Boss 302, and a drag race stroked 427 FE. The last one is getting an old custom made mechanical injection intake I want to convert to electronic fuel injection, preferrably without the tell-tale injector rails and also as stand-alone as possible. Any assistance or recommendations regarding these projects would be greatly appreciated. I also have an Electromotive Tec II system for a V8 to use, but it would mean I can't run a magneto, so I'm probably going to use it on the Boss 302. 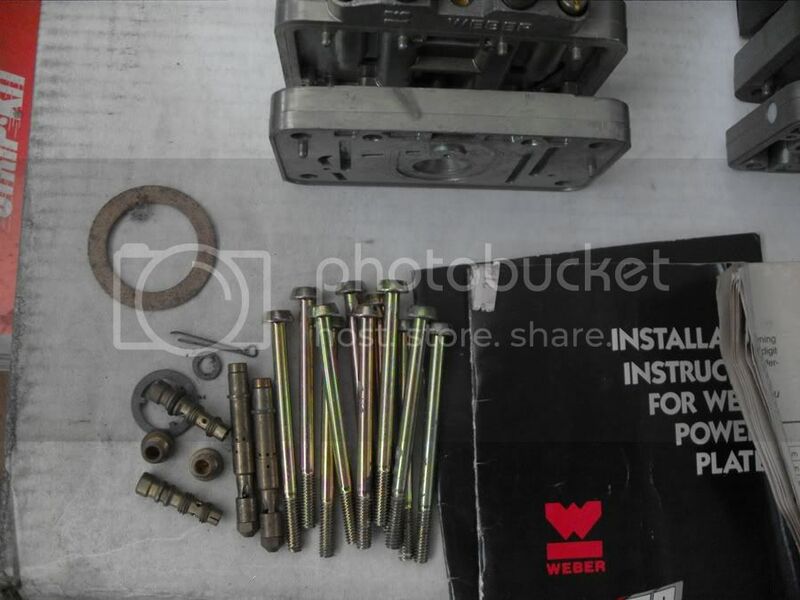 As for the Weber Power Plates, I didn't realize so much work was required to get them functioning, as I was long under the impression they could be used out of the box for improved performance and tunability. Thanks for clearing that up. I may just put the whole kit-and-kaboodle up for sale. Is there anything I should save for my Webers? no1musclecar wrote: Thanks for the heads up, and the leads/recommendations. The brass metering parts, E-Tubes, jets, bleeds, and jet holders are the same as your 48 IDA carbs, compare them and see. You need sets of 8 but spare anything for those carbs is nice to have. Just went thru this. The idle air jets-jet holders ard different than what would be in a 48 IDA. I think the e-tube holders are different too. Runit wrote: Just went thru this. The idle air jets-jet holders ard different than what would be in a 48 IDA. I think the e-tube holders are different too. Well, my bad then. I just looked in the pile and see the holders are different. I have been using the brass metering parts, jets, bleeds, tubes and idle jets from power plate kits in a DCOE recently and I was thinking I was using the holders too. The metering parts are the same as IDA. 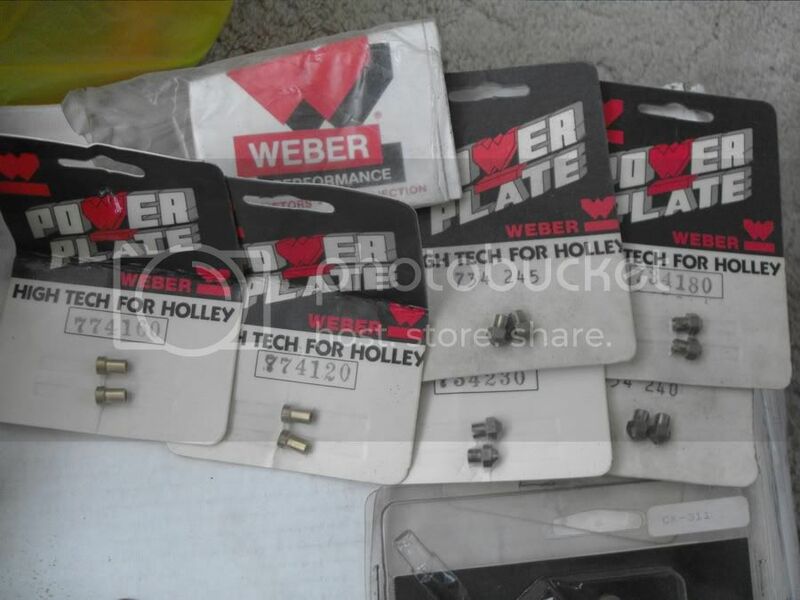 #1, if you still want to play with add-on metering plates in your Holley, Percy's has some that seem to work; some custom carb builders say the plates can improve mileage without losing power. They replace the main jet with an adjustable height needle- kind of a mash-up of a Holley and a Rochester. No personal experience- my pair of swap-meet Percy's plates are still in a box in the shop. My current tuner-Holley 4778 gives decent power and 20 mpg at 80 mph from a reworked 351-C, so I suspect what I'll get is a bunch of work, more complication and no real improvement. And that may describe most of these redesigns of the Holley 4bbl. 1 ea. 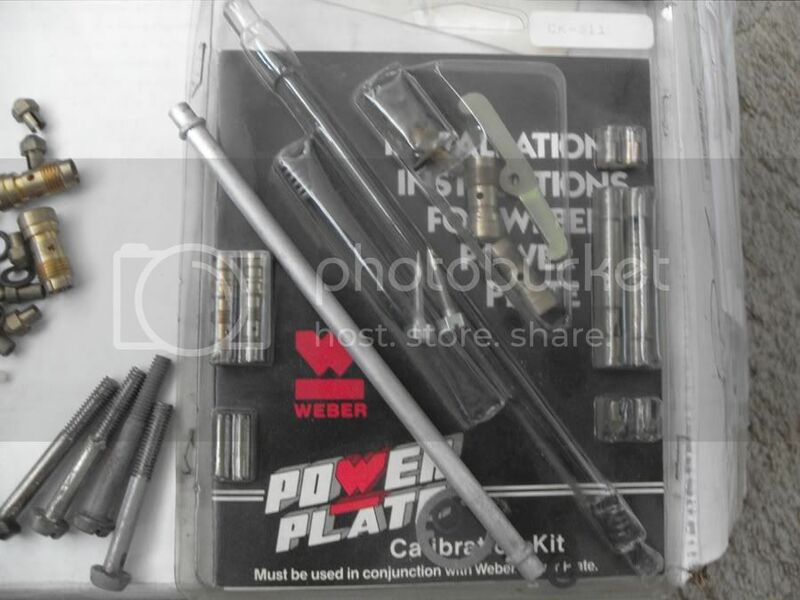 box PK-302: 1 unassembled plate kit, some std. 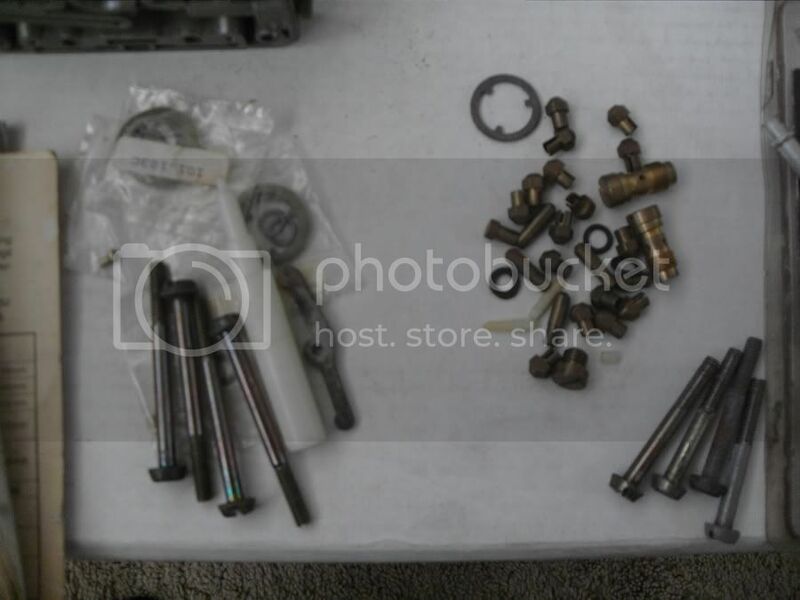 bowl bolts, 2 ea. 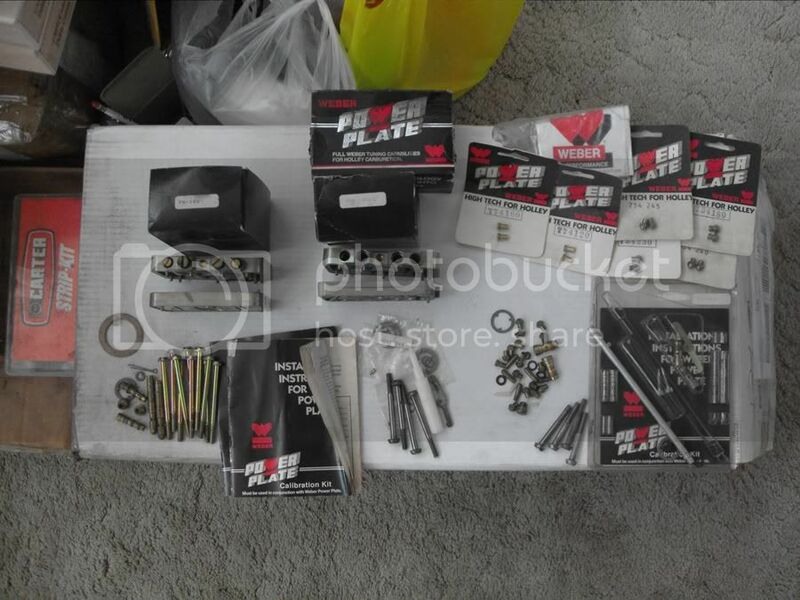 #101.103 power valve gaskets?, 2 pks. small air bleeds?, plastic tool? 1 ea. pkg. CK-311: calibration kit, appears complete, may have wrong long transfer tube? pile of small jets and misc parts.